And how did my brother-in-law describe it from his time over seas in the military? “Chunky and sour”? Well (tsk), my goat milk doesn’t taste like that. I bet yours doesn’t either. If you aren’t convinced about goat milk yet, you might be surprised at the astonishing benefits of goat milk and when you add the benefits of raw milk, your body will thank you immensely! There are a few things we can do as goat milkers, and milkers in general, to ensure that our milk is as fresh and best tasting as possible. Diet. There is no getting around that what you eat affects the heath of your body. And as a lactating mother myself, I know that what I put into my body as food, affects the output and quality of milk I provide for my baby. This same principle is true for the animals you milk. What they eat affects the nutrition of their milk, and the taste. Cleanliness. The utensils used must be kept clean and sterile. And the goats should be thoroughly cleaned before milking. 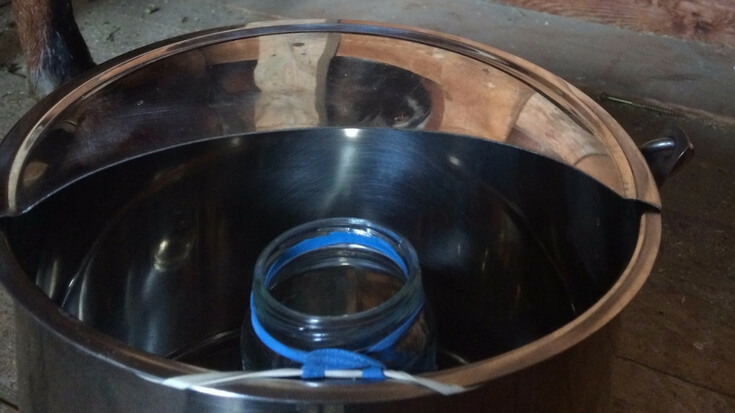 And a strip cup should be used to catch the first few streams of milk from eat teat. 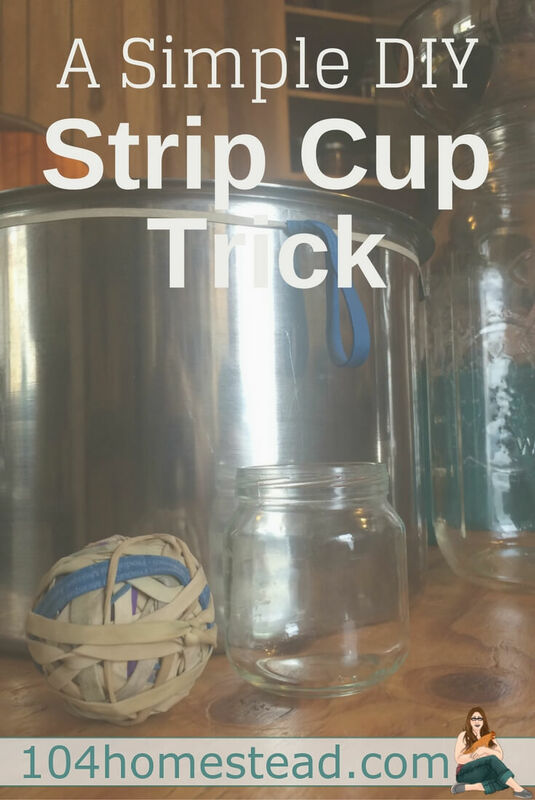 Why should a strip cup be used? In the first few streams of milk, any abnormalities such as blood or clots will be detected. The first few streams of milk contain the most bacteria and dirt. When life is already so full of all the house, animal and garden chores, it can be overwhelming to have that one more thing to remember, right? Although I have never trained a young goat (yet) to milk, my active imagination conjures up many wild scenes of crying and spilled milk. I have a doe who is very touchy. If a young helper decides to pet her while she is being milked or a fly lands on her leg or you stop milking her for any reason, she may just decide that she is done. Those back legs can sure clam up! And on several occasions she has managed to step into the bucket. So starting to milk into a small cup and then removing the cup and then bringing in the bigger pail and starting over can be a hassle. 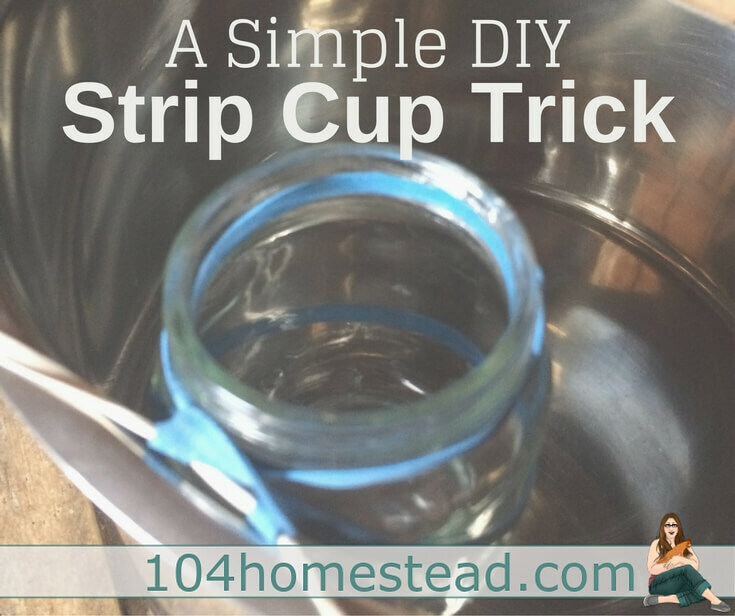 Introducing… the simple strip cup milking hack! 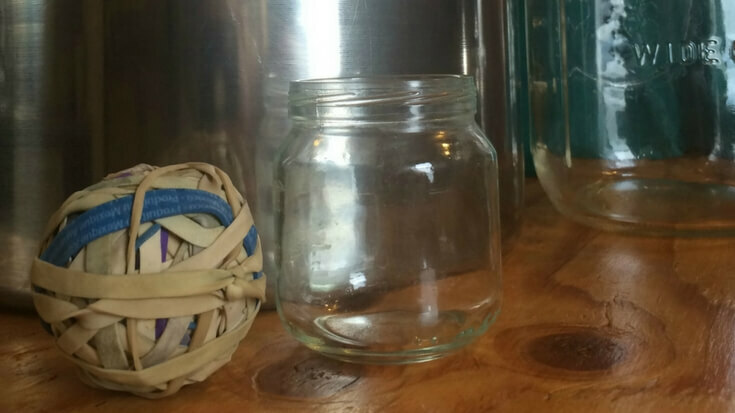 All you need is your milking pail, two rubber bands from your rubber band ball 😉 and a small container. I happen to have excess baby food jars lying around so that works ideal for me. Some people prefer having a black strip cup because the contrast of the black cup and white milk make it easy to see any problems. Most “official” strip cups, which can range from $7-$20, are black as well. From my perspective, I can easily see anything wrong with the milk in this glass container. I contemplated using wire, but that could potentially scratch my stainless steel pail. And a string might work but knots loosen easily and I didn’t want to be continually re-tying it. So, rubber bands it is! Take a peek at how it works in action and see if it’s a good solution for you! 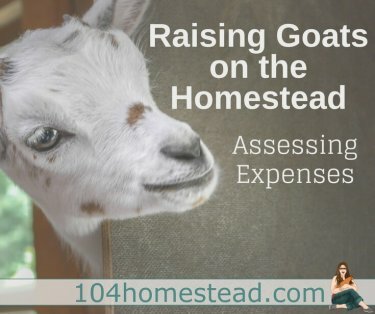 Before you go, take a moment to get access to these free printables to help you on your homesteading journey, including printouts for homesteading, goats, bees and horse care.